There are many books written about what is known as channelling or being able to communicate with the spirit world and one of the most popular aspects of this ability is how to contact your spirit guide. In this post we are going to show you a method that you can adopt by dowsing with a pendulum. To avoid publishing duplicate content you need to read the pendulum instructions on this post. 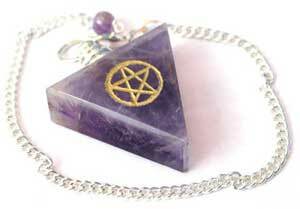 Predict Your Future by Reading the Tarot with Pendulum Dowsing. You may in any case find this a good practise for what we are going to do, although doing it anymore than once a day is going to lose its effect. For this exercise, you really need to relax switch off from the outside world and go into a trance state of consciousness that will allow you to connect with your spirit guide. Have you ever felt that your intuition is telling you something well that is the feeling we are going to try and achieve. Some psychics work on the ability to hear things so for them communication is quite easy, however as with any contact with the other side what you are told may not necessarily make sense. Just as in the real world, there are those who will mislead you or worse, so if you feel any negative energy, tell it to go away. You need some practise with the pendulum, just spin the pendulum do not ask any questions, the idea is not so much what the pendulum tells you but what do you feel and what are you telling yourself? Once you can accurately use the pendulum on various charts you need to move onto an Alphabet Wheel click on the link to down load and print it out. Practise with the wheel asking simple questions, do not try to use it to predict the future that is in your hands, if you do get an answer it is usually going to be negative! If you pick up any negative energies spin the pendulum and tell it to go away. After a while it is not the words that are spelled out by the pendulum that is important, its what you feel or what your own intuition is telling you. However, to find out the name of your guide simply ask and they should spell it out for you, if you get gibberish then you have picked up something negative. Always go back and check your answer a few days later so you get a consistent reply. This entry was posted in Featured Posts and tagged consciousness, energy, health and wellness, intuition, negativity, pendulum, psychic, spirituality, tarot. Bookmark the permalink.